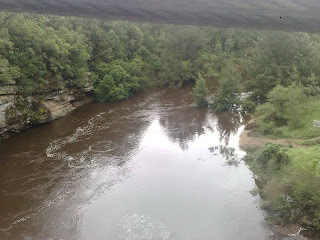 This is the Kangaroo River 7th Feb, 2010. I'm standing on the Hampton Bridge looking down river. 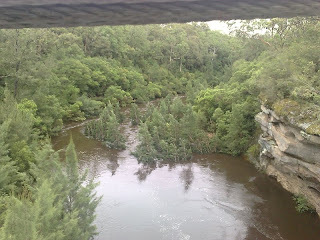 See those trees in the middle of the river, they are normally on dry ground. This is from on top of the bridge looking up river. The river normally is about half as wide. The pine trees on the right hand side are on dry ground and you can walk around easy with out getting your feet wet to the left. In fact it was only a couple of weekends ago that people where sitting under them for shade on a 40 degree day, while others paddled in the river. We walked down to take a closer look. Normally you don't have to walk up here amoungst the grass but there was no where else to walk. 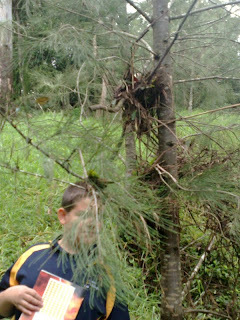 Do you notice the rubbish in the trees? Thats how high the river has been in the last 3 days. Looking up the embankment there was a very distinct flattening of grass of where the water had been flowing. Master J is standing up against the tree to give a better understanding of how much high the water got. 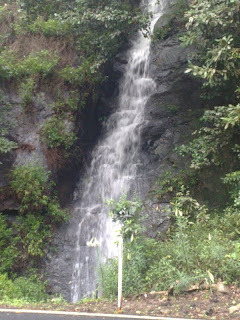 This waterfall picture was taken on the Camberwarra Road between Kangaroo Valley and the top of mount Camberwarra. Normally there is no water flowing down the side of the mountain but as you can see today there is plenty. 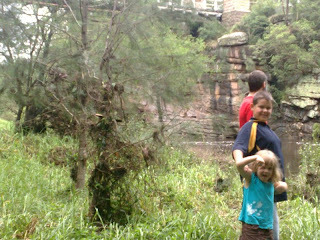 I took the kids to Pathfinders yesterday and it was flowing pretty good then as well.